Do you want to be a superstar? We all dream of being a superstar in some point of our life, to be on the wall of fame and to be noticed by the world. Well, Rummy Circle can help you become the next rummy superstar! You have the opportunity to become the star for an entire month by participating in the ‘Rummy Superstar’ promotion by Rummy Circle. The Rummy Superstar tournament is tailored for the players who love to take part in the high roller tables in Rummy Circle. If you are the one, head straight to Rummy Circle Now. Players can take part in this huge tournament and win from a total prize pool of Rs.20 Lakhs! The winner can take home a prize of Rs.5 Lakhs. The tournament is scheduled to live on 21st May 2017 at 6:00 PM. You can register for the tourney from 4:55 PM to 5:55 PM. Please find the details of the tournament below. The entry fee for the tournament is Rs.10,000, and a total of 216 players can participate in the tournament. If you win, you will be featured in the Rummy Circle site for an entire month! 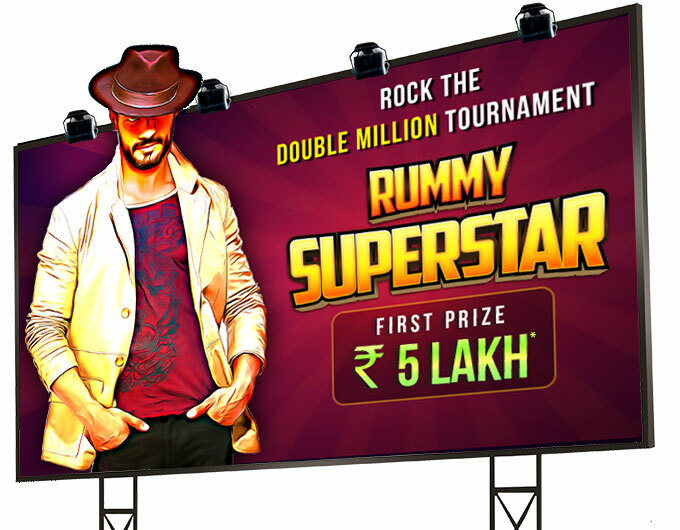 It is your chance to win big and be the renowned Rummy Superstar. So, if you are interested in taking part in the tournament, head straight to Rummy Circle and register for the special tourney today. Read our blogs to learn how to earn money by playing rummy. Please do let us know what you would like to see in Rummy Mania, in the comment section below. Keep Playing!